 In only its fourth year of publication, this upstart anthology sweeps the honors from Edward D. Hoch's much longer- running series (see above) by dint of including everything in sight. You'll find not only Doug Allyn's Edgar-winning ``The Dancing Bear,'' but all the other Edgar-nominated stories by Brendan DuBois, Brenda Melton Burnham, Justin Scott, Lawrence Block, and Bill Pronzini; not only Ian Rankin's Gold Dagger- winning ``A Deep Hole,'' but the other shortlisted nominees by Jo Bannister, Ed Gorman, and Liz Holliday. 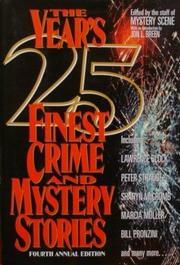 In addition to Peter Straub's jazz novella ``Porkpie Hat,'' the offerings include stories by Max Allan Collins, J.A. Jance, John Lutz, Sharyn McCrumb, Nancy Pickard, and Dana Stabenow, with top honors going to ``The Man Who Hated Television,'' one of Julian Symons's last and trickiest stories. Edited and introduced as if by a committee (as, presumably, it was), but still a terrific bargain, and the year's anthology of choice.